We start with some truly exciting news in Anaheim. Starting next month in Disney California Adventure, you can experience the delightful 3-D movie Mickey’s PhilharMagic. For the uninitiated who haven’t experienced this musical experience at Walt Disney World, Mickey’s PhilharMagic is a wild and crazy journey through a handful of memorable moments in Disney animated films, as seen through the eyes of Donald Duck after his attempt to take over for Mickey as a conductor of a magical orchestra gets out of hand. Taking the place of the late, lamented Muppet-Vision 3-D, Mickey’s PhilharMagic is a welcome addition to Hollywood Land, and one you should check out ASAP. If you’ve traveled to the Disneyland Resort lately, you know that the entire resort area is undergoing a pretty extensive series of renovations as part of their Project Stardust campaign. With the arrival of Star Wars: Galaxy’s Edge on the way, they want to expedite guest traffic as much as possible, which can be challenging even before you get out of your car. The parking situation is about to change, with the arrival of the Pixar Pals parking lot, adjacent to the Mickey & Friends lot. Pixar Pals will have roughly 5,000 spots, and offers an electronic system to handle your parking. The new lot should be open by July, and not a moment too soon. Here’s a change to both Disneyland and Walt Disney World that is long overdue: starting May 1, as you can see above, the parks will be entirely smoke-free. Currently, you have to travel pretty far out of the way within the parks to find one of the few smoking areas. Seeing as, at least at Disneyland, one of the smoking areas is a stone’s throw from the Galaxy’s Edge section, it’s no surprise that Disney is making this change. And listen, you can do whatever you want, but smoking is both gross and exceptionally dangerous. So the only problem with this story is that it took Disney this long to prohibit smoking at the parks. Hard to imagine that we should be thinking about the fall already, but Disney World is. The upcoming Mickey’s Halloween Party event will be coupled with a brand-new fireworks spectacular, which is still unnamed. It’s replacing the previous version of the Halloween fireworks show, which had been around for nearly 15 years. Plus, this Halloween, there will be new ride overlays on the PeopleMover, Big Thunder Mountain Railroad, and Monsters, Inc. Laugh Floor. Big Thunder Mountain, especially, is a perfect candidate for a spooky overlay. So get excited! There are changes aplenty at Disney World in the late summer, too. 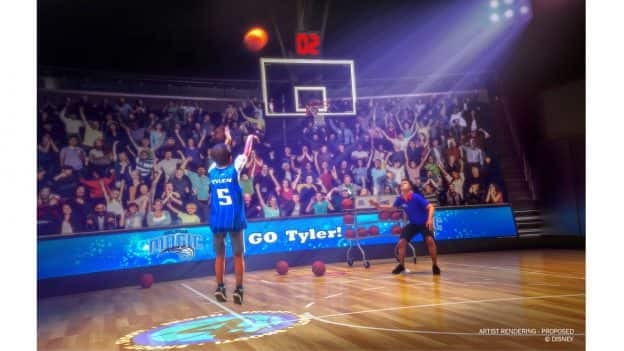 Of course, their version of Galaxy’s Edge opens at the end of August, but earlier that month, Disney Springs has an all-new experience for all you basketball fans. The NBA Experience opens on August 12, enabling fans of the game to step into the shoes of their favorite players and test their hand at basketball skills. You can test your slam dunks, shooting skills, and more with the NBA Experience with 13 activities spread out on two floors. Let’s talk a bit more about Star Wars: Galaxy’s Edge, at least at Disneyland. As you may know, the new land opens on May 31, and for the first three weeks it’s open, guests of the Disneyland hotels get an exclusive reservation for a given day to spend in the new area. But let’s say you’re not one of those lucky folks, and you’d like to get in before June 24. Well…sorry, Charlie, but you’re out of luck: no standby access will be available for the first three weeks, and even those with reservations will be restricted to a specific amount of time. This seems harsh, but is also a product of the parks still figuring out how to handle the inevitable influx of crowds. Just consider yourself lucky if you’re stepping into the galaxy far, far away before June 24.